The increase of functionality offered by today’s control systems based on embedded systems requires more effort to verify the controlled system, as a malfunction can yield catastrophic results. These systems are usually hybrid systems, mixing continuous and discrete dynamics. When analyzing a hybrid system, the dimension of the state space is often so large that formal verification is out of the question. Its analysis can be carried out using abstraction, namely constructing a system with a smaller state space, preserving the properties to verify in the original system. 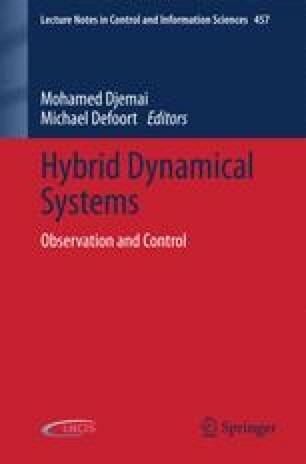 Making use of a notion of diagnosability for hybrid systems, generalizing the notion of observability, in this paper it is shown an abstraction procedure translating a hybrid system into a timed automaton, in order to verify observability and diagnosability properties. The subclass of hybrid systems here considered is that of the durational graphs. We propose a procedure to check diagnosability, and show that the verification problem belongs to the complexity class P. This procedure is applied to an electromagnetic valve system for camless engines.